Galileo Was Wrong: The Earth Revolves Around Lawyers! In Biglaw, there's an established hierarchy: Partners are at the top of the heap, followed by junior partners, non-equity partners, senior associates, associates, paralegals and then staff (although some C-level administrators have risen to a more exalted status). Where do clients fit in? It depends. Sometimes they are listed in strategy documents as more important than the partners, but generally we know this not to be true. In actual fact, few law firms rely on client needs as their driving force. 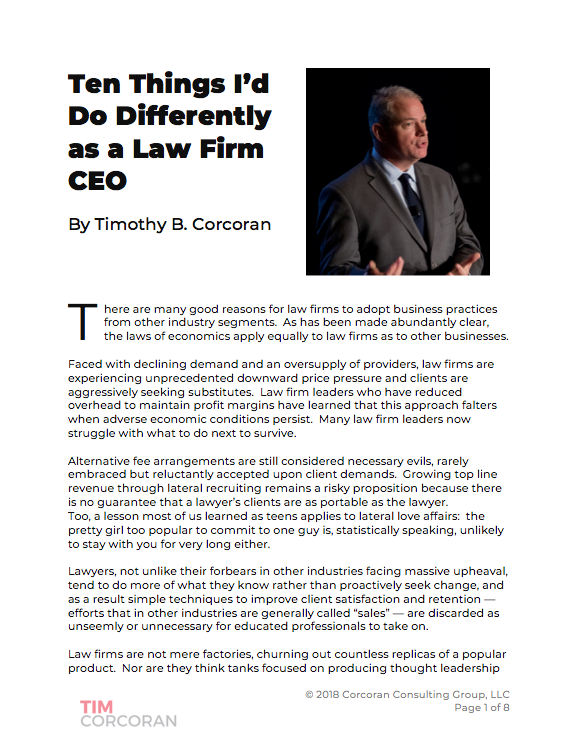 Law firms are law firm-centric. In fairness, the legal market is at the tail end of a cycle of near limitless demand for legal services. In a demand-rich market, existing clients and new clients will come calling no matter what you do, so it's hard to expect a change in behavior when it's so profitable to stay the course. But where clients are concerned, there is general agreement that the client's law department, represented by the General Counsel or Chief Legal Officer, is the appropriate focus of attention. By and large this works. Many business leaders aren't sophisticated enough to grasp the nuances of legal issues, so it's best to have a buffer between the businesspeople and the lawyers/counselors. I don't buy it. I've had the good fortune to lead divisions of publicly-traded businesses, and I can't recall a single instance where I or my colleagues felt insufficiently equipped to address business or marketplace issues and as a result needed to turn to our in-house law department or outside counsel for insights. In fact the opposite was often true. In over a decade of boardroom participation, only a few enlightened colleagues of mine regularly invited the General Counsel or law department liaison to our strategy meetings. These were the same leaders who invited the head of HR to attend as well. The feeling was, it's important for everyone to understand what we're trying to accomplish as a business, and what challenges we face, so everyone can execute their function in accordance with the agreed-upon goals. Very rarely did the HR leader or the lawyers have a speaking role in the substantive discussions, though they were expected to provide updates on their functional areas. This is not a slight to the in-house lawyers or HR professionals. It's merely a fact. In any enterprise there are those who formulate strategy and those who execute. The legal department and the HR departments executed. On a number of occasions where we gathered with the board or executive team of an acquisition target in a secret location to discuss a business combination, we always invited the lawyers because there were items on the checklist that only they could handle. But they otherwise didn't speak much. When outside lawyers were invited, they sat next to the in-house lawyers and spoke even less. Again, none of this is meant to demean the important role lawyers play in doing deals, but the point is they were there to identify and quantify risks in executing the deal so the business people could incorporate this into the financials, or choose to build versus buy if the risk was too great. We never asked for a go/no-go decision, and we didn't ask for exhaustive explanations of the legal issues in play. We asked about the obstacles, the techniques to overcome the obstacles, and the cost of doing so -- and not the legal cost, i.e., the legal bills, but the cost to proceed. For example, I wouldn't want to know how much the law firm will charge to counsel us on new regulations; I wanted to know how complying with new regulations would impact the cash flow projections. Again, the point is, on the business side we rarely think of things in legal terms, but in terms of how legal issues impact our ability to proceed. In point of fact, the earth does not revolve around the lawyers. I met recently with the managing partner of a well-established mid-size firm. I was advised that he was brilliant, an incomparable mind in a firm of brilliant minds, which led to his status as the firm's leading rainmaker for a generation. Indeed I found him charming, engaging and clearly of high intellect. But his "secret" approach to winning business is simple and he knows it: he discusses business issues with his prospects and clients, always looking at things from a business perspective rather than a legal perspective. As a result, he has become a trusted business advisor to his clients, not merely a lawyer. This partner is held in high esteem by his colleagues, but many find his approach mystical and unconventional. I find it to be perfectly in keeping with the sentiment expressed above. Business executives don't need legal advice; they need to identify and quantify how legal issues will impact business decisions. This managing partner is concerned that not enough of his young lawyers get this point. I think he's right. CFO: Legal costs keep going up, both in absolute dollars and as a percent of revenue. Other cost centers – HR, Marketing, Facilities, and even my own Finance department – have driven costs down as a percent of revenue. Sure, we face more regulations and law suits. But give me a break. Lots of articles report on in-house lawyers complaining about costs. The GC response? Precious little beyond begging for discounts. CEO: Have we identified the cost centers that have unallocated funding and swept them of all but the costs linked to our strategic priorities? CFO: All but the legal department. They claim there are too many uncertainties to fix a budget beyond headcount costs, and even these may fluctuate depending on the volume of legal work. CEO: Hogwash. Give them another chance to establish a budget using a decision tree or Bayesean analysis or whatever methods they feel are appropriate, incorporating the risks and complexity of our strategic priorities. If they can't do it, assign them a fixed reduction percentage and then tie the GC's bonus to achieving the funding envelope. If this conversation hasn't occurred in the board room of most companies in recent months, it will. In a recent interview a colleague conducted with a General Counsel, we learned that the GC was given a mandate by his CEO to reduce legal spending by 70%. Ouch! If you're a law firm partner, are you ready to help your client identify and quantify the risks associated with his organization's business strategy? Do you understand that if you are unable to participate in this discussion, there are many other law firms who are gearing up for this exact conversation? What will you be doing instead?